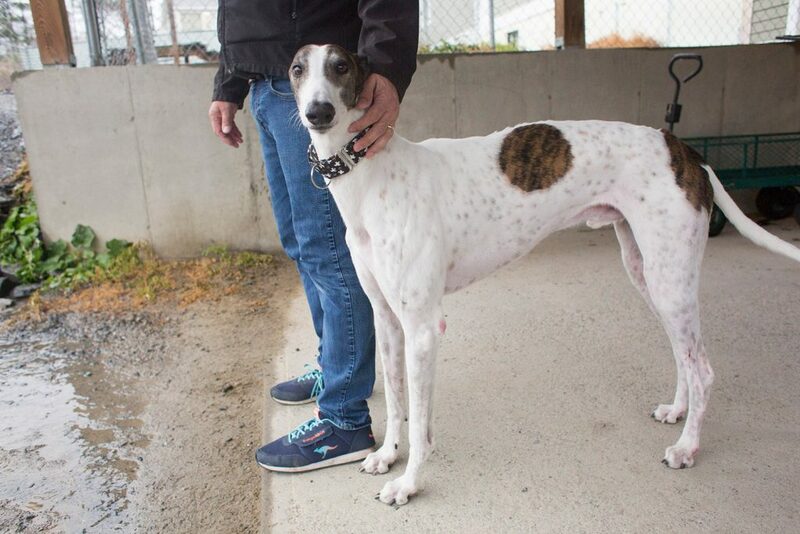 The Maine Greyhound Placement Service is expecting a surge in former racing dogs needing new homes as their southern owners get out of the racing business. Maine’s primary service for placing retired greyhound racing dogs with loving owners is about to get a lot busier because of a decision by Florida voters to end greyhound racing in their state. 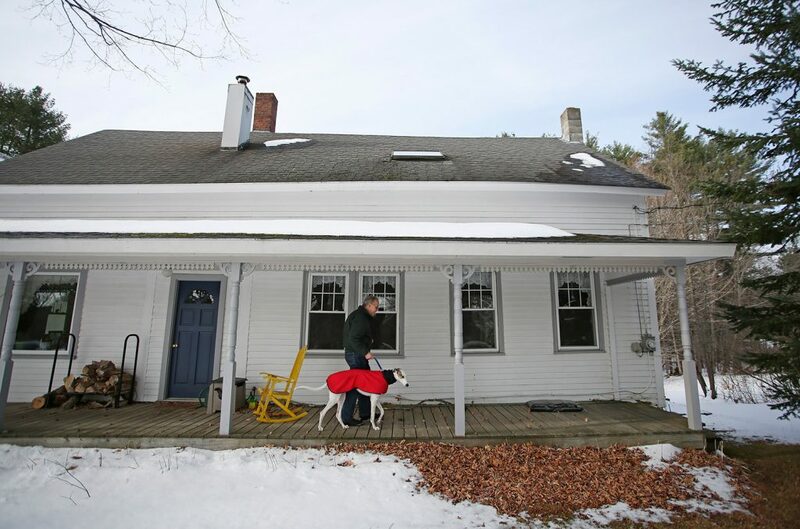 Maine Greyhound Placement Service in Augusta has found permanent homes for over 4,000 greyhounds in its 26 years of operation. Currently, most of those dogs come from Florida and Alabama, two of only six states that still have active greyhound racing operations. For more information about donating, volunteering or adopting a greyhound, call Maine Greyhound Placement Service at 626-2893 or visit greyhoundplacement.com. But that’s about to change. On Nov. 6, Florida voters approved Amendment 13, a measure that bans all wagering on dog races as of Jan. 1, 2021. As a result, many of the thousands of registered racing greyhounds in the state no longer will be wanted by their owners and breeders. 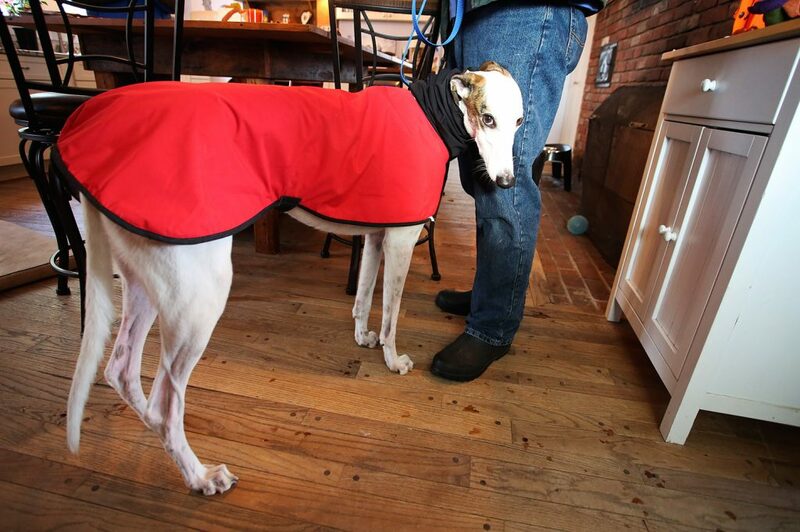 Maine Greyhound is one of several organizations that will help them find new homes. 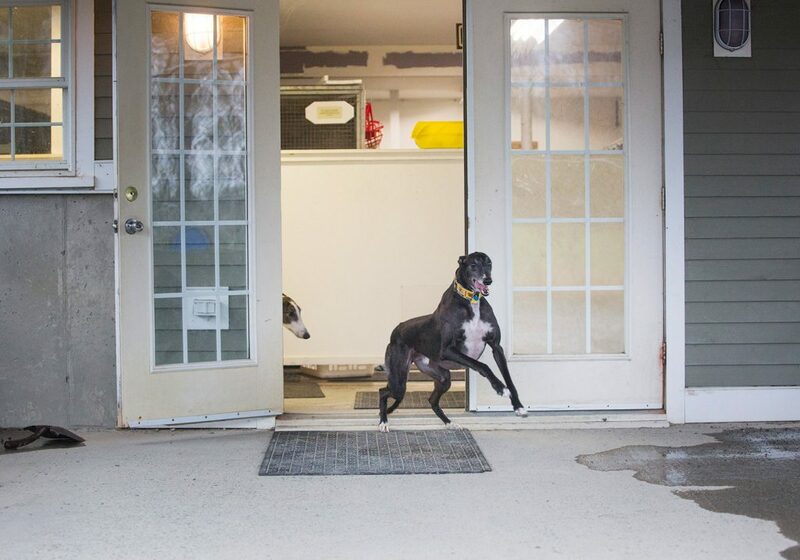 Maine Greyhound places up to 200 retired greyhounds with families across northern New England each year from its adoption kennel in Augusta. It receives a relatively large share of such dogs because it is the only facility of its kind in the region with a full-service veterinary clinic. Greyhounds can go on to live long and happy lives after racing. The dogs, which usually live 12 to 14 years, are required by law to be retired from racing by age 5. Most don’t even race that long. 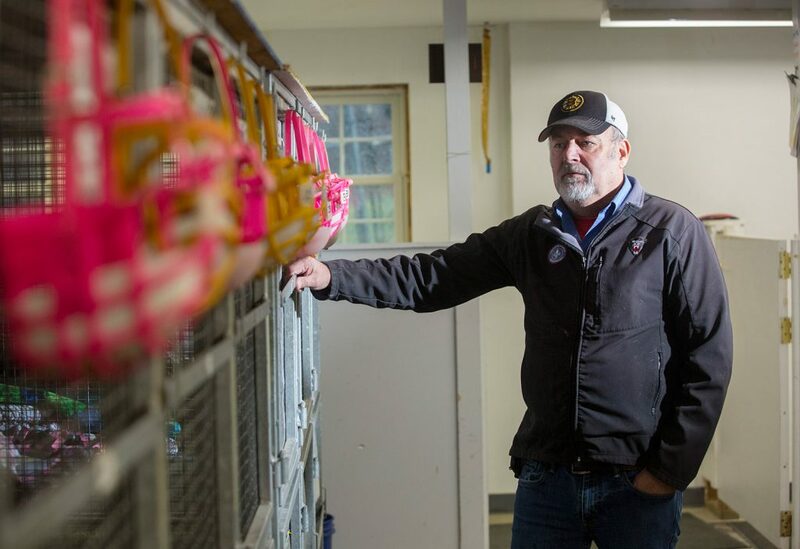 Scott Bruns, executive director of Maine Greyhound Placement Service in Augusta, looks over a row of empty crates on Nov. 13. The kennel is gearing up for a big influx of dogs because Florida voters have decided to end greyhound racing in their state. It can be jarring for a greyhound to make the transition from a racing life to life as a pet, Bruns said. Most former racing dogs have had very limited interaction with humans and are used to sleeping and eating alone in a cage. They have never slept in close proximity to a human or shared an eating space with another dog. As racing dogs, they eat, sleep and go to the bathroom on a strict schedule that is determined by the racing owner. They don’t learn basic pet skills such as how to let their owner know that they need to go outside to relieve themselves. Many greyhounds don’t even recognize their own names, because they’ve never needed to. All they know is racing, and they’ll jump at the chance to speed off in any direction – often into oncoming traffic – if let off the leash outdoors. 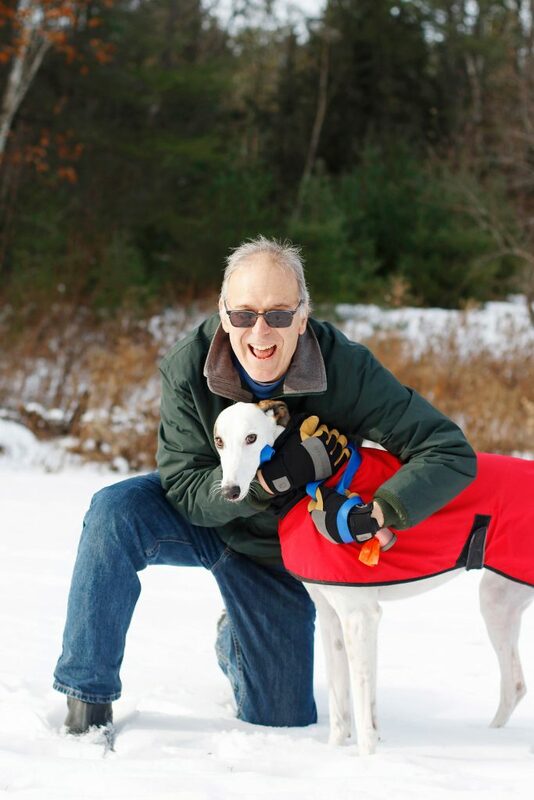 Maine Greyhound engages in a rigorous interview and education process with all prospective owners to make sure they understand in advance the challenges as well as the joys of owning a retired racing dog. The service has been extremely successful, with a very low rate of returns despite all owners having to sign a contract that requires them to return their greyhound if they can’t handle the responsibilities of ownership. 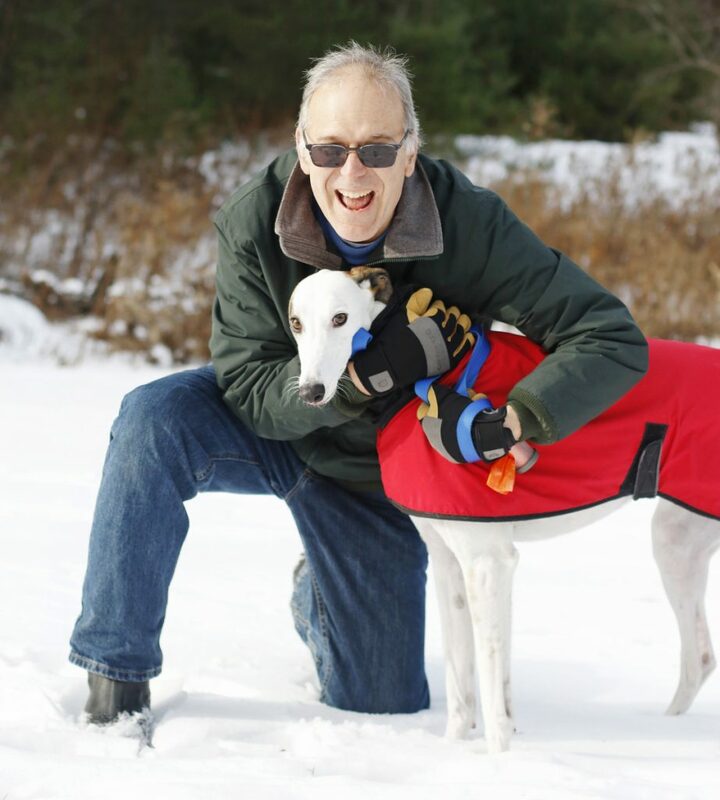 Maine Greyhound’s efforts earned it a national award in 2017 from the American Greyhound Council, which named it Greyhound Adoption Program of the Year for 2016 in the eastern U.S.
Rick Andrew of Greene, who with his wife adopted Righty through the greyhound placement service, says the dog has adjusted well and is a pleasure to have as a pet. Maureen and Rick Andrew of Greene adopted Righty, a 3-year-old greyhound originally from Kansas, in March from Maine Greyhound. The couple had lost their previous dog a year earlier and were finally ready to add a new member to the family. Rick Andrew said the couple has owned many dogs over the years, but that adopting a greyhound was a different experience. 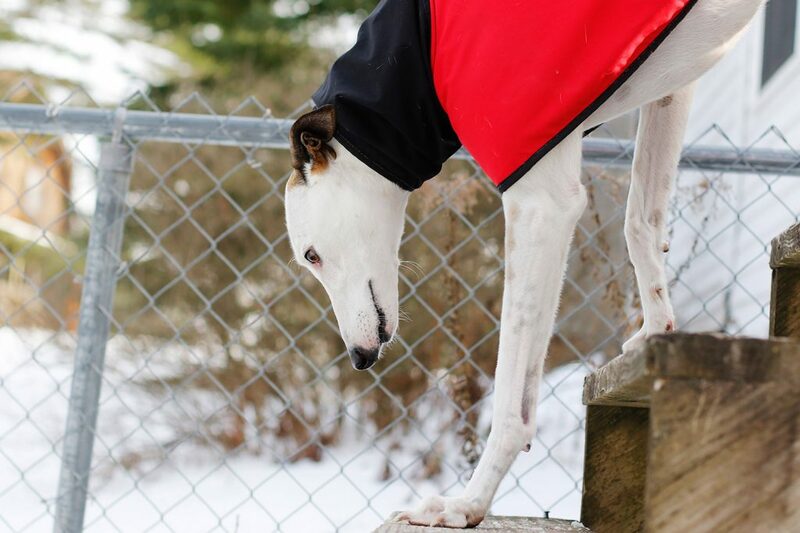 Despite initial challenges such as helping Righty get over separation anxiety and teaching him how to use steps, which Righty had never done before, Andrew said the young greyhound has adjusted well to his new life and is a pleasure to have as a pet. “They are beautiful, beautiful animals, and very calm and just incredibly gentle,” he said. According to Maine Greyhound, most retired racing dogs can adjust to their role as pets in a relatively short time with the proper training and attention. 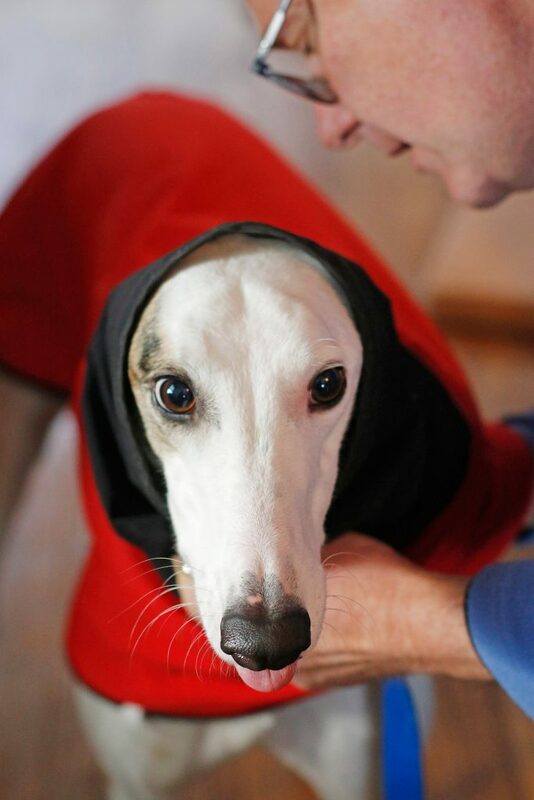 Greyhounds are highly intelligent, eager to please and respond well to any positive attention. Retired racing greyhounds tend to be gentle, good-natured dogs that get along well with children and other pets, according to Maine Greyhound. They are generally grateful for their new homes and reward loving owners with constant affection. Florida’s Amendment 13 was promoted by animal rights groups, including the American Society for the Prevention of Cruelty to Animals, which argued that racing is cruel to greyhounds and too often results in their injury or premature death. According to GREY2K USA, another animal rights group supporting the amendment, a total of over 15,000 greyhound injuries were documented from January 2008 to April 2018, the most common of which were broken legs. At two West Virginia dog tracks, about 8,200 greyhound injuries were reported between January 2008 and March 2018, including roughly 400 dogs that died or were euthanized, the group said. Bruns said his organization remains neutral on the issue of greyhound racing. The U.S. greyhound racing industry is tightly regulated with high standards of care, he said, and there is a concern that if all U.S. racing is banned, then the industry would simply move offshore to a country where standards are lower – or nonexistent. 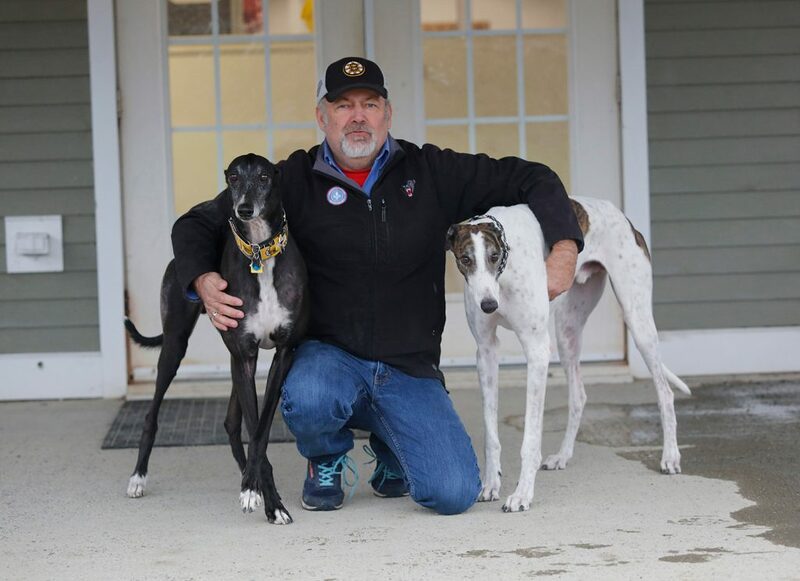 For now, Maine Greyhound’s most pressing concern is preparing for the expected surge in dogs that will need to find new homes as Florida’s racing operations are shut down. Bruns said his organization has ample facilities and volunteer staff, but that it will need to step up its fundraising activities to cover the cost of additional food and supplies.